After Tony returned from Drew Estate’s Cigar Safari in April, he raved about a cigar he sampled during the trip. The cigar was a highlight of the trip for him and he even managed to sneak one out of country. Tony, being the generous man that he is, gifted me the only remaining sample of the Joya De Nicaragua Rosalones he had. During the trip, he was informed that this cigar was exclusive to Spain. I figured this would be the only sample I would ever get to try and decided to hold onto the cigar. Months passed by, the cigar remained in the humidor, and an unexpected e-mail from Cigars International arrived in my inbox offering the JDN Rosalones at a crazy low price (Well, I have nothing to compare the price to but I couldn’t believe it from all of the good I heard from Tony). Immediately, I jumped on the deal blind and ordered a box of the Consul (4.7 by 48). Was it worth the blind purchase or should I have tried the sample before committing to a box? 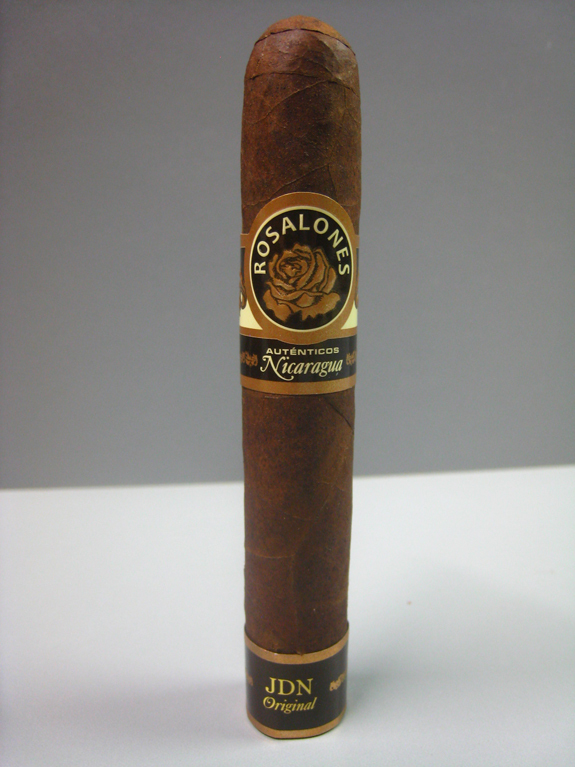 Rosalones is one of the original brands produced in the beginnings of Joya de Nicaragua. It’s been considered the small brother of Joya de Nicaragua Clásico. 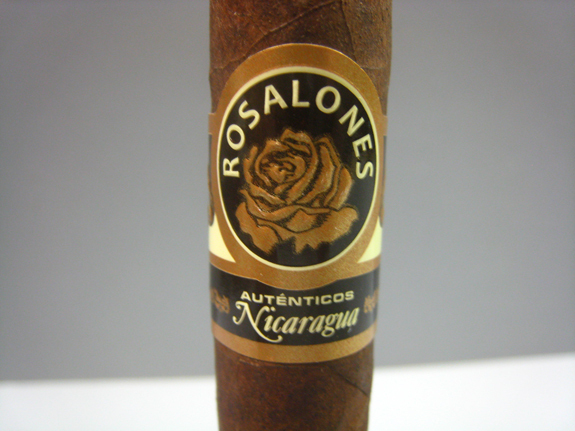 Returning to the market at the end of 2010, after two decades of rest, Rosalones is an affordable alternative to Nicaragua’s taste. 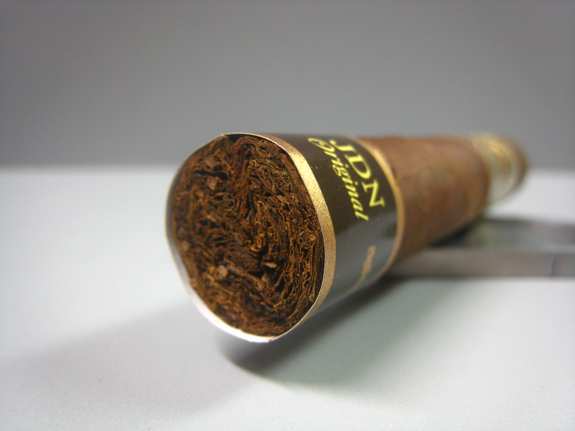 While the JDN Clasico is a milder body smoke that wears a Ecuadorian Connecticut Shade wrapper, the Rosalones wears a Nicaraguan Criollo wrapper and is said to be a medium body smoke. The Nicaraguan Criollo wrapper is dark brown with a deep red, almost burnt orange, hue (too much Texas college football?). Quite a few medium veins are easily noticeable and black marks are scattered down the leaf. By no means is this the prettiest wrapper I have ever seen. The cigar has been packed evenly and firmly. The wrapper aroma is of vinegar and cardboard, while the foot is a completely different story. Sweet notes of chocolate, espresso, and faint pepper jump off of the foot and some spice can be felt in my nasal passage. The Rosalones sports a large double cap and, once cut, a decent draw is revealed. There is a little bit more resistance than I would prefer. The cold draw brings out rich cinnamon , chocolate and a mild spice. A decent amount of smoke is being produced by this JDN Rosalones. The smoke is light on the palate but the flavors are much darker than expected. Notes of black coffee, earth, cocoa, dry cedar (pencil-shavings), and pepper are making up the profile. The coffee lingers on the finish of the smoke for a good amount of time. My palate is left dry after each puff requiring a sip of water to refresh my palate. The retrohale brings out the familiar Nicaraguan pepper and spice I have come to love. A beautiful light grey ash is being formed. Flavors are coming across medium and I am feeling a little kick of nicotine. Along with the peppery spice, cinnamon is now in the mix that is warming my palate and a tingle is felt at the back of my throat. A thick, rich, syrupy sweetness is meshing with the coffee, cedar, and cocoa. The smoke, which was light on the palate in the first third, has become more chewy and is no longer leaving my palate dry. So far so good with the ash and burn that are still performing above par. Removing the band, I am into the final third. 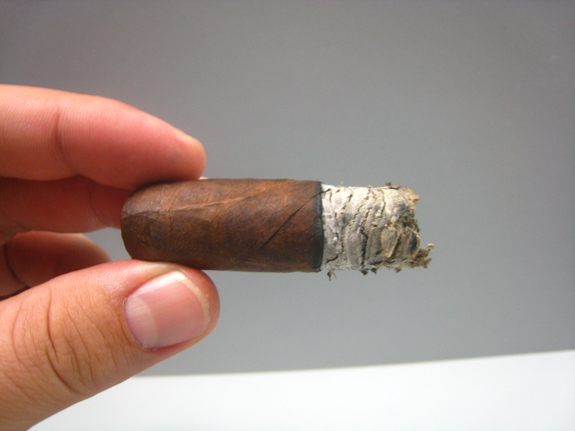 Side note: Joya De Nicaragua could lighten up on the amount of glue applied to the band. The flavors have remained consistent with the previous third but the richness has picked up. Cocoa has evolved more to a sweet milk chocolate. The flavors are the most rounded and balanced they have been throughout the entire smoke. 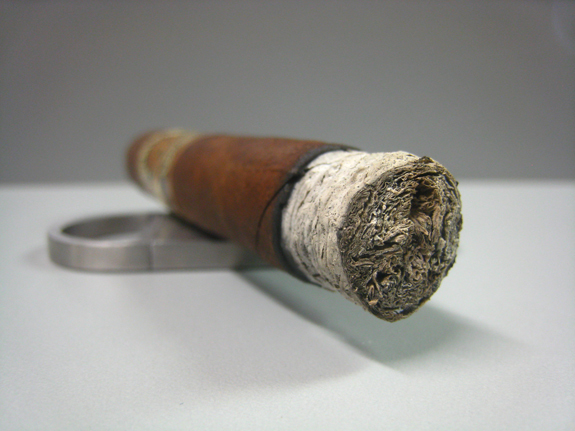 As I put the cigar to a close, the ash is a bit flaky but the burn remained right on till the very end. I have heard it said that cigars taste completely different in Nicaragua. Whether it is the environment, the people, or the combination of both, smoking in one of the cigar capitols of the world can sway your opinion and provide a completely different experience with a cigar. Since I jumped on a box of the Rosalones without ever smoking one, I sure hoped that this wasn’t the case with Tony and the Rosalones. After smoking a handful of these sticks, I am very pleased to report that it wasn’t the case at all. 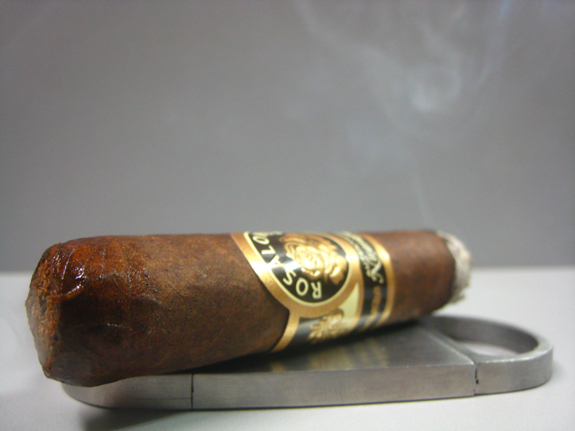 The Joya De Nicaragua Rosalones is a solid smoke that delivers rich flavors of earth, cocoa, cedar, and pepper. The construction and performance of the Rosalones are rock solid. The stick is said to be a medium body smoke, but seems to sit right at the borderline of medium and full to me. At $3.25 per stick, this cigar is seriously a no-brainer. Already, the JDN Rosalones is in my weekly rotation and I expect it to remain there until I can no longer find them. It’s so funny because I went on Cigar Safari this year and had a Rosalones. I never heard of it, or any hype,etc. But I loved the one I had there and immediately started asking how to get my mitts on some. And I sent Jose Blanco messages,etc. But as you mentioned- sorry they were Spain only. Then when I heard they are available now in the US I was so excited and bought a box hoping, as you did, that they would be the same. Well, it’s so difficult to say if they are exactly the same as the one I had in Nicaragua- but it’s easy to say they taste great and are worth twice the price. Couldn’t agree more that the Rosalones is easily worth twice the price. 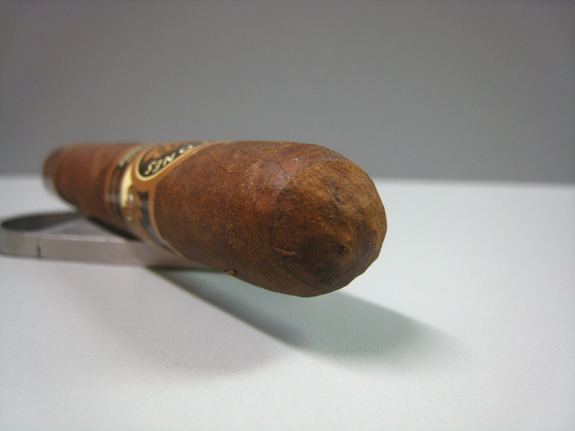 Joya has always made excellent cigars, in my opinion, and it is nice to see a valued-price cigar in their portfolio. Thanks for check out the review! Great review.. I must try this….. That is all. NOW go about your day! Thanks, Corey. I shall now go about my day. Added to the list. Damn, it never ends. Hahaha. I feel the same way. Sorry. Jeremy – Finally got around to trying this, and you’re absolutely right. It’s a no-brainer, not only at the price, but even if it were higher. I think some added resting time would make it even better, if you could resist temptation. Thanks for the heads up! Hey, Jeff! Hope all is well. I have had the cigars in the humi for about 2 months now and they are smoking fantastic. The little added rest made this already good cigar even better. I am glad you enjoyed it! Which size did you smoke? Jeremy, I have the 448, same as you. Great size for this cigar, I think. Jeremy, nice review. Having my 2nd Rosalones out of a 10 pack as im reading your review. Great cigar, but I am having an issue with a very tight draw. I dont remember the 1st being so tight. Hopin the rest aren’t. Anyway, nice job with your review.